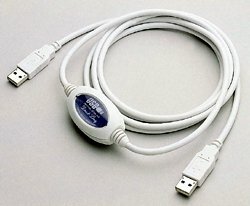 The Model BF-100C USB File Transfer Cable is the fast solution to peer-to-peer file transfer between two computers via their USB Ports. The transfer rate is up to 10 times faster than using a Serial or Parallel port connection. 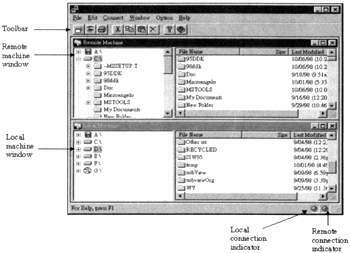 The Direct-Linq application program, furnished with the cable, features a Windows Explorer-like interface that makes file transfer as easy as "drag and drop". To install, simply plug in the cable and install the software. The Direct-Linq cable can be used with any two computers that are running the Windows® 98, ME, XP or 2000 operating system, as well as the Apple OS 8.6 or OS 9.0 operating system, and have USB connections installed. The Direct-Linq File Manager Software (shown below) must be installed on both computers. The Direct-Linq can connect two Windows computers, two Apple computers, one one of each.